Sign up for private guitar lessons today at Grosse Pointe Music Academy in Canton or Grosse Pointe Woods. Learn how to play acoustic guitar, electric guitar, or bass guitar. Taking guitar lessons with a university-trained guitar instructor does not necessarily mean you have to study classical music and classical guitar. It’s just one of the many styles you can study at Grosse Pointe Music Academy! Beginning guitar lessons will focus on the fundamentals of guitar playing and music theory. Regardless of the style, most beginning guitar players will learn chords, scales, note reading, basic songs, and other rudiments. Once you begin to advance and lean toward playing a particular style of music, you will want a teacher with the versatility to help you on that path. Guitar playing has many styles, including rock, blues, jazz, country, funk, rockabilly—and most of these styles have sub styles also. 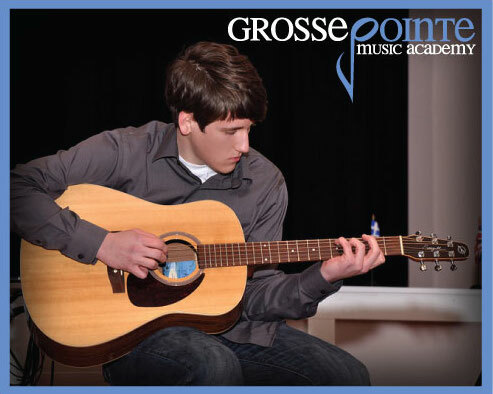 At Grosse Pointe Music Academy, you can learn fundamental guitar and advance to play any song or style that you wish. Many of our teachers actively perform in bands. Our guitar teachers have college or university music training so they know the proper theory and technique no matter if a student is interested in heavy metal or in classical. Guitar lessons at our schools are enhanced by the opportunity of learning how to jam with other musicians in a rock band setting, guitar ensemble or how to perform solo in one of our recitals. No matter what type of guitar lessons you are interested in, we have the teachers to help you. Typically a student would be 7 before starting guitar lessons, due to their hand size, but some younger students start with a junior sized guitar. All of our instrumental lessons are 30, 45, or 60 minutes in length. Most students will have one guitar lesson once per week. The 30-minute lesson is the minimum amount of time necessary to recite from a previous lesson and learn a new one, but there typically will not be much time left for repetition of the new material. This amount of time is good for younger students (ages 5-11). The 45-minute guitar lesson allows additional time to cover more material for a faster-paced student or more time to recite with constant critiquing from your guitar instructor. The additional time in the lesson is very valuable for some students but not necessarily for others. The 60-minute lesson is for students who enjoy guitar as their primary activity and are committed strongly to practicing every day. Hourlong lessons allow time for increased material to be covered, with more time for critiquing. If you are unsure as to which lesson length is best, it is safest (and perfectly fine) to start with 30-minute private guitar lessons. Child guitar students may find that they are not ready to leave after half an hour and often will tell their parents that they want more lesson time. Online lessons and other reference sites are great to stay motivated throughout the week! The size of the guitar is also very important to guitar-playing success. Small bodies need smaller instruments, talk to your local music store about finding a properly sized guitar for yourself or your child. Every aspiring guitar player will take a unique approach to learning this complex instrument. Our guitar teachers understand this and will help you “play” to your strengths and challenge your weaknesses so you may grow to advance your playing. If you’re serious about learning guitar, call Grosse Pointe Music Academy today. We are here to get you rockin’! It’s easy to set up lessons! Just come by the studio or call us at 313.458.7723 in Grosse Pointe or 734.418.0640 in Canton.